Guest article! Joe Flood’s name’s been seen around here a time or two before, and you can check out his book “Murder in Ocean Hall” or follow him on The Twitter. The piece below originally appeared on JoeFlood.com. With this photo, I have inadvertently started a kerfuffle (love that word). It was part of a series of photos I took of the Washington Monument inspection for earthquake damage. 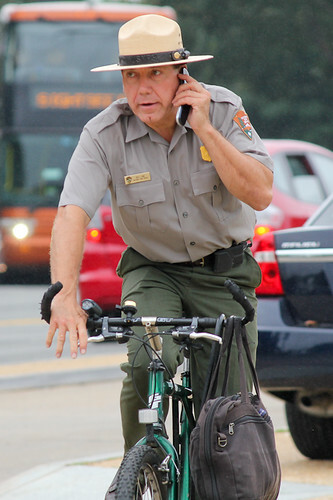 I took the above photo because I thought it was kind of funny – a park ranger in his big hat on a bike. I submitted it to The Wash Cycle, a local blog on bike advocacy. They ran it with the cheeky title, Only You Can Prevent Bicycle Crashes. Commenters on the site identified the ranger as Bill Line, spokesperson for the National Park Service. He’s infamous among local bike advocates for opposing the expansion of DC’s bikesharing service to the National Mall. And here he is riding a bike. Not only that, he’s not wearing a helmet and talking on a cellphone. A bag swings from his handlebars, unsafely. Commenters on the site also critiqued his ancient flip-phone and ratty handlebar tape. Without meaning to, I made news. This simple photo tells a story. Several of them actually, if you want to interpret the image that way. It reveals the hypocrisy of bike opponents riding bikes, as well as a cavalier attitude toward bike safety. This blog kerfuffle also highlights the fact that public servants are public. What they do is out in the open and possibly recorded by accidental citizen journalists, like myself. I was on a job interview recently and was asked to define “open government,” the movement to make government transparent and accountable to citizens. This photo is a perfect (though minor) illustration of open government in action, showing what happens when citizens get an unvarnished look at public servants at work. There is a difference between riding a bike on the street and wanting bikes to be used on NPS land. In fact, maybe part of the reason he does not want bikes is because people would not follow safety procedures. This would not be hypocrisy then.